Here is a maintenance kit for the Hill Handpump. It's meant for the shooter that wants to take his handpump apart and replace the ORings and relube the entire pump. 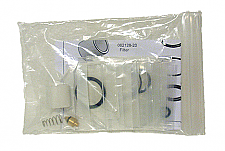 The Hill Maintenance Kit contains all the necessary ORings, Spring, Replacement Valve and Filter to do the job. The lube (Silicone Lube) can be purchased separately. Use the Gen3 maintenance kit for the newer pumps with the tripple rings engraved in the top and bottom of the pump shaft.